If your web surfing experience is constantly disrupted by third-party ads labeled as “ads by Albireo” or “powered by Albireo,” your computer is most probably infected with an adware program called Albireo. Even if it is a newcomer on the web, this application is not new to us at all. In fact, it belongs to an astronomically named group of useless ad-supported programs that include Canopus, CoronaBorealis, and Capricornus. This is the kind of malware infection that does not hide too long and you will definitely notice its present once you go browsing the web. This adware shows rather annoying pop-up ads and coupons that may cover a relatively big portion of your screen. But, of course, that is not the only and most important reason why we suggest that you remove Albireo right now. As a matter of fact, these third-party advertisements may be gateways to cyber criminals and their malicious websites. Therefore, clicking on them is rather risky and not advisable under any circumstances. Please read our full report on this infection if you want to safeguard your operating system from further malware attacks. Since this worthless application has no real function, it is obvious that you will not find a promotional website where you could download it as a standalone installer. Instead, this adware uses the questionable software bundling distribution method to travel on the web. This way it is possible that you can get infected with this adware anywhere in the world. The reason behind is quite simple: These bundles are promoted on questionable file-sharing websites that are available from most of the world. These infectious bundles usually contain a number of malware installers to make sure that unsuspecting computer users get enough headaches in one single go. You need to be very careful when you are looking for free software to install because an innocent web search can easily lead you to suspicious freeware and torrent sites as well. These pages are usually filled with potentially harmful third-party ads. If you click on any of these, you may download a whole package of malware installers onto your machine. It is also possible that there are some adware programs on your computer and these are responsible for the pop-up or banner advertisements you click on and that results in the download of such bundles that may contain this adware. In any case, it is quite likely that your PC is inhabited by a number of malware programs now, including adware programs, browser hijackers, and potentially unwanted programs as well. Therefore, we suggest that you start recovering your system by removing Albireo and then, scan your computer for other possible threats. 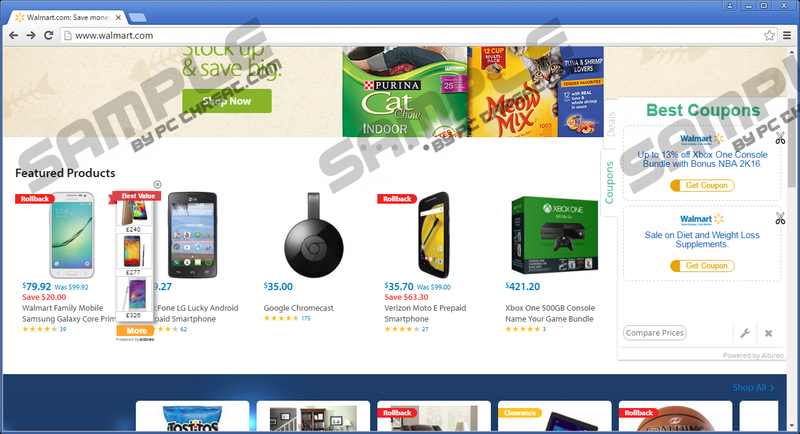 We have found that this ad-supported program installs as Shopperz but it displays ads by Albireo. This adware replaces your dnsapi.dll file and makes DNS setting changes to display advertisements. It seems that this application is built on the same engine as Jabuticaba. Therefore, you cannot simply delete Albireo through your Control Panel. This adware may display potentially unreliable third-party commercial advertisements on your screen while you are browsing the net. Unfortunately, these ads are not only very distracting, but they are also quite risky. It is possible that this application collects information about you that is tantamount to spying on you in other words. Based on the gathered data, customized advertisements can be sent to your screen, which may serve as baits. Once you click on such an ad, you may be redirected to a malicious website run by crooks. There are a lot of things that may happen if you ever land on bad websites. You may infect your computer with more threats, you may be tricked out of your personal details, but you may also disclose your bank account information if you are not careful enough. These scenarios can end quite badly for you. If you do not want any of these, we recommend that you remove Albireo right away. Unfortunately, ending this nightmare of an adware program is not a simple and single click; although you do need to start by uninstalling this application via Control Panel. But then, you also have to restore your DNS settings as well as the dnsapi.dll if you want to make it all go away without a trace. Please follow our instructions below carefully to be successful with this mission. Keep in mind that this may not be the only threat to address now. You cannot leave any other infection on your computer because it will not be safe for you to use. Therefore, we recommend that you install a reliable anti-malware application that will also prevent further malware infections from being able to penetrate your computer. Pick Network and Internet and open Network and Sharing Center. Select Internet Protocol Version 4 (TCP/IPv4)/Internet Protocol Version 6 (TCP/IPv6) in the item list box and click Properties. Mark the “Obtain DNS server address automatically” option and press OK.
Click Properties and pick Internet Protocol Version 4 (TCP/IPv4)/Internet Protocol Version 6 (TCP/IPv6). Click Properties and mark “Obtain DNS Server address automatically”. Select Internet Protocol (TCP/IP) on the Local Area Connection Properties panel. Click Properties and select “Obtain DNS server address automatically”. Tap Win+R and type in cmd to open the Command Window. Press OK. If you have a 64-bit system, type in “sfc /scanfile=C:\Windows\syswow64\dnsapi.dll”. Quick & tested solution for Albireo removal.